Confliction doesn't always mean having to choose. It could mean you just need to combine. This is the case with this downtown cool leather sneaker and skate boot hybrid from a unique collaboration between the progressive label ODD and footwear company Praxis. 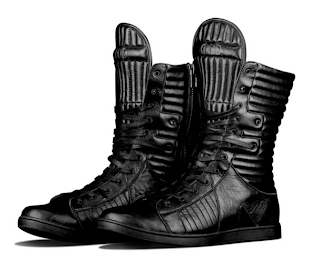 Surprisingly lightweight with the well-constructed heft of a combat boot meets a skate shoe, its a pretty nice shoe to continue on with the cool dark aesthetic that's taking over mens fashion during the warmer months. Complete with side zip, waxed laces and pattern quilting & stitching and available now for $375 in a limited run of 500 pairs at ODD's Lower East Side store in NYC and at ODD-Style.com.